The blog silence can be explained by a huge amount of disruption at home (which is also work as many people will know) - illustrations have been carried out to the noise of banging, scraping, drilling, sawing, bashing and stair-stomping. The answer is always the same. Because I can, and I should. It's exactly because they shove me a bit rudely out of the usual Inkymole comfort zone that I do them. Bringing people from 3 to 3000 miles away to take part feels like a massive responsibility, but when it's done, I feel like I do when I've run for much longer than I have before - surprised I'm still intact, and surprised at how much I've stretched myself. Luckily with this show, I've also enlisted the help of Tom Hare, Ed Garland, Anthony Saint James with Demdike Stare for musical accompaniant and 16th Century inspired vegan food designed by Jed Smith - who by day currently works for a famous Michelin starred West End restaurant. 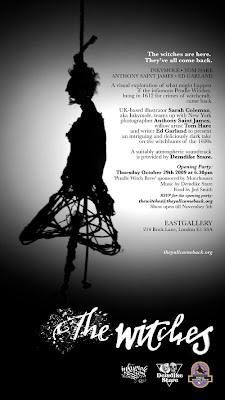 The opening party is on the 29th of October and starts at 6pm until 9pm. The show runs until the 5th of November. You will come along, won't you?